glutathionepathway.com will sometimes use affiliate links in supplement reviews to support the maintenance of the site. 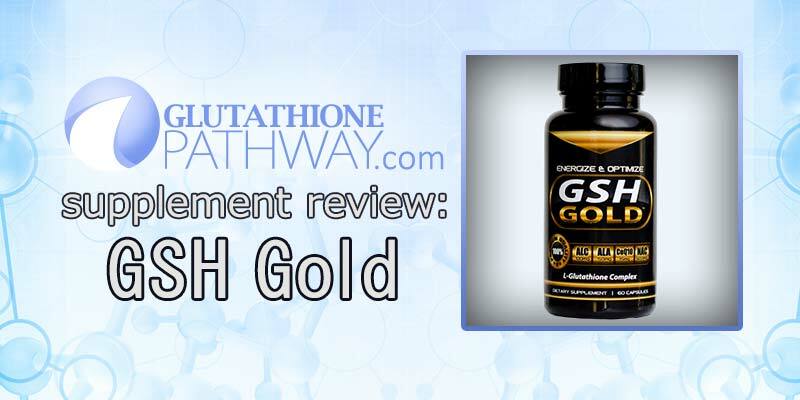 GSH Gold appears to be one of the newer GSH supplements on the block, and uses L-glutathione in a formula of supportive ingredients. This is a rich formula of ingredients that features L-glutathione as the primary and direct GSH enhancer. What makes the formula interesting is it also features GSH precursors, enhancers, and recyclers like N-Acetyl-L-Cysteine and Alpha Lipoic Acid. The GSH Gold formula includes complex and methyl based B vitamins like methylcobalamin and 5-methyltetrahydrofolic acid. 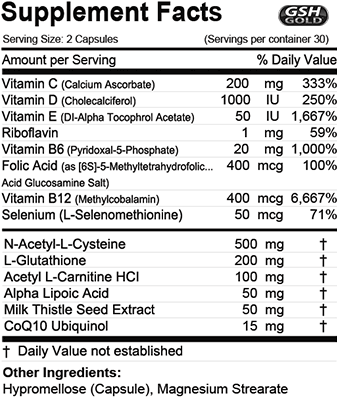 Not to mention our favorite supplement vitamin D, liver supporting milk thistle, even some CoQ10 in ubiquinol form. One of the best GSH formulas we have seen on the market, it provides a direct way to boost GSH directly, but it also supports your overall health with other well thought out ingredients. A strong focus on liver health, methylation cycles for those with MTHFR, cellular energy, immune system support and overall health improvement. L-Glutathione – 200 mg – This is pure, basic, reduced glutathione. There used to be a belief that it would not be absorbed and required liposomal or acetyl versions to receive properly absorb but recent evidence and newer more advanced measuring techniques have shown that L-glutathione does pass through the stomach. N-Acetyl-L-Cysteine – 500 mg – The rate limiting factor in your body’s own production of glutathione tends to be cysteine. NAC provides a quick boost to your natural production of GSH. Acetyl L-Carnitine HCI – 100 mg – Thought of as an energy supplement, acetyl l-carnitine plays a role in cellular metabolism and transporting fatty acids. Alpha Lipoic Acid – 50 mg – A powerful antioxidant that is water and fat soluble with big health potential. It’s been used for diabetics to help insulin sensitivity, losing body fat, muscle regeneration, cognitive benefits, and more. Selenium – 50 mcg – A trace element important to thyroid function and hormone balance but also to properly reducing glutathione within the body. Milk Thistle – 50 mg – A traditional remedy that’s used to promote liver health by promoting GSH and inhibiting lipid peroxidation. Ubiquinol CoQ10 – 15 mg – The fully reduced form of CoQ10 that is crucial to energy production and commonly used for cardiovascular health benefits. It’s a powerful antioxidant with great molecular energy benefits. Vitamin B2 (riboflavin) – 1 mg – Part of any good B vitamin complex Riboflavin is part of metabolism for energy, fats, carbohydrates and proteins. Vitamin B6 (pyridoxal-5-phosphate) – 20 mg – The active form of B6 is the most effective form for supplementing. Low levels are associated with inflammatory issues, and B6 is part of metabolic processes including neurotransmitter synthesis and methylation cycles. Vitamin B9 Folate – 400 mcg – Often found in cheap folic acid form, folate is integral to good health and proper production of new cells. The 5-MTHF form is available immediately to the body, and circumvents folate absorption issues some people with the MTHFR gene mutation may deal with. Vitamin B12 (methylcobalamin) – 400 mcg – This methyl form provides your body yet another methyl donor instead of the cheaper cyanocobalmin that uses up a methyl donor to rid your body of the cyanide the B vitamin is attached to. Vitamin C (calcium ascorbate) – 200 mg – Everyone knows Vitamin C is important to good health, and humans can’t synthesize it on our own so we need a regular intake. It along with other ingredients helps promote GSH. Vitamin D3 – 1000 IU – The favorite vitamin supplement pick of glutathione pathway. Vitamin D3 is an absorbable form of the prolific vitamin that is being associated with many immune health functions. Vitamin E – 50 IU – Another antioxidant that’s most associated with age and skin health, Vitamin E can help other metabolic processes and work as an anti-inflammatory and immune booster. So far most glutathione supplements we’ve seen are just that… a glutathione supplement. It’s refreshing to see a formula that seems well thought out with adjunct ingredients that should work together to promote a more holistic approach. This is a supplement that uses multiple health pathways to promote your overall well being and immune health. While some may question the absorb-ability of L-Glutathione, they should feel confident that the latest data supports it as an effective way to supplement. The GSH Gold formula seems to “get it” the formula puts together some of the most important nutrients into one simple daily supplement. Beyond that, the price point makes sense. It would be hard to gather the ingredients listed above, in the solidly bio-active forms they are in, for any kind of reasonable price on your own. They’ve done it for you. A relatively new company, with a relatively new product. The GSH Gold formula appears to be raising the bar in daily supplements as one of the most sustainable ways to directly supplement glutathione with fantastic adjunct ingredients. We are excited to see a formula that seems to be made for health enthusiasts who know what to look for. It combines some of the most significant health supplement ingredients into a simple daily dose at a reasonable price. We love what they are doing and think GSH Gold is the best glutathione supplement available as of our writing this. Leave a comment and tell us what you think of GSH Gold. This is a complex formula of health enhancing ingredients at a reasonable price. Effective glutathione supporting ingredients for a pretty perfect one a day style supplement. Thank you I was about to order. Please let me know in Dubai where can I buy this product GSH Gold Glutheoin. .
You should be able to find GSH gold at gshgold.com – We haven’t reviewed any GSH supplements based on whitening, so unfortunately I’m not sure. We focus primarily on glutathione for long term health.